I usually try to end the week on a positive note, but I don’t know how to do that this week. I watched Dr. Ford’s testimony yesterday in tears, followed by more tears today as sexual assault survivors bravely confront Senators only to be told their pain and experiences don’t matter. I’m heartbroken. I’m angry. I’m dumbfounded that anyone truly believes that Judge Kavanaugh is the most qualified person to serve a lifetime appointment to the highest court in our country. We can do so much better, and I personally think the Administration could nominate someone much more appropriate. But at minimum, we owe it to ourselves to require our elected officials to hold themselves, and this nomination, to a higher standard. The full Senate vote has been postponed to allow for a full FBI investigation, so now is the time to make your voice heard! Today I’m partnering with three talented designers – Ladyfingers Letterpress, Boss Dotty, and Jennifer Vallez – to offer printable versions of their artwork to help you express your views to your Senators. Call, email, write letters, join a protest, or march yourself down to your Senator’s office if you are able to do so! This is really the only thing we can do right now. You can look up the address and phone number for your two senators here. This is particularly important if you live in a red state or a swing vote like Alaska, Maine, North Dakota, and West Virginia. Senator Flake has said he will vote to confirm Kavanaugh, but perhaps if enough of you reach out we can change his mind. Phone mailboxes for many Senators are full, but you can also email your Senator directly by clicking the contact link below each Senator’s name on this page. My name is Sarah Smith and I’m a constituent at 109 Main Street, Townsville, California. I’m calling to urge Senator Feinstein to demand that the Senate delay any vote to confirm Brett Kavanaugh until the FBI investigates the serious and credible sexual assault allegations against Judge Kavanaugh. Law enforcement must assess these claims before Kavanaugh can be appointed to a lifetime seat on our nation’s highest court. Thank you for your time and attention. My name is Sarah Smith and I’m a constituent at 109 Main Street, Townsville, North Dakota. I’m calling/writing to ask Senator Heitkamp to vote NO on the nomination of Judge Kavanaugh to the Supreme Court. Kavanaugh’s open partisanship, flagrant disrespect for many Senators, and basic dishonesty disqualified him from ever serving on the Supreme Court. The American people deserve a better nominee for a lifetime appointment to the highest court in our country. Please vote NO on the confirmation of Judge Kavanaugh. Thank you for your time and attention. And if you get phone anxiety and want to get a message to your representatives out quickly, Resistbot is a texting service that will deliver your message for you. Text the word RESIST to 50409 to get started. You can download the postcards through the links below – a big thanks to these amazing artists for making these files available to us! There are several poster options along with printable postcards for writing directly to your Senators. The posters are sized as 11×17 and 12×18 since that seems to be the sizes most commonly used by online printing services. Just be sure to print on cover weight paper or card stock (I’d suggest 80 lb or above) so they’re sturdy enough to carry. Step 1. Download the printable Believe Women postcard file and print on any white or light colored card stock. The postcards are double sided, so be sure to follow the instructions for double-sided printing on your home printer. Step 2. The cards are designed to be a quarter sheet of paper each, so you’ll get four cards per sheet of card stock. Once you’ve printed both sides, cut straight down the middle vertically and horizontally. A paper trimmer is easiest if you have one, or scissors if you don’t have one. Step 3. Write your text and address of your senator or representative. See the text above if you need a suggestion for what to write! Then add a stamp and pop into the closest mailbox. Note: If you have any trouble with double-sided printing, just print the front side and cut from there. The back file helps provide a guide for your text, address, and stamp, but isn’t necessary for mailing. The only thing giving me hope right now is this banner from the Suffragette movement, via the National Woman’s Party. It’s a reminder of a time that women banded together to demand the right to vote. If you haven’t already, you can register to vote here. We still have a long way to go, but we now have a powerful voice as women. Let’s use that voice and our voting power to do better. How to Make Marbled Paper – plus new Marbled Notebooks and Calendars from May Designs! Planning a visit to Washington, DC? 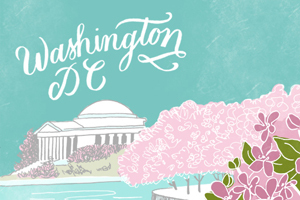 Check out my mini-guide to DC, including where to go, places to eat, and more!